Lake Evinrude has two new residents, two trumpeter swans, a male and a female, named Boo and Ghost. The pair has adjusted well to the new surroundings, exploring all Lake Evinrude has to offer, in addition to chasing geese around at times. Raised by humans at a rehabilitation facility, Boo and Ghost are already quite comfortable around people. The Zoo plays a role in the trumpeter swan recovery program and many young swans raised here help with the species’ recovery. Boo and Ghost enjoy a variety of food, including scratch grains, gamebird food, romaine lettuce and the occasional mealworms. The swans also eat water plants and other natural foods found in the lake. Living on Lake Evinrude, the swans’ environment is very naturalistic and stimulating for the birds. Treat foods, mirrors and novel objects to explore and manipulate are also offered by zookeepers for enrichment. These birds are young and still have some gray juvenile feathers on their heads. As the birds age, the feathers will turn white. 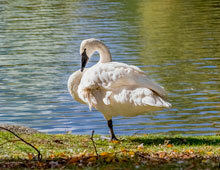 Common among many species of swans, trumpeter swans mate for life. The trumpeter swans are protected under the United States Migratory Bird Act. While not endangered, habitat destruction is a threat to these swans. A variety of states list trumpeter swans as state-threatened. 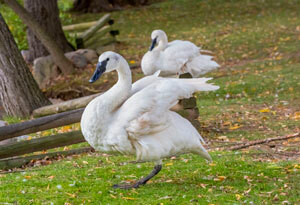 The swans are on Lake Evinrude year-round, so stop by to give Boo and Ghost a warm welcome to the Milwaukee County Zoo.